The current global governance system is in flux as the centrality of global institutions is weakened, and nation states are reasserting their powers. At the same time the in-between layer of global governance (between global institutions and nation states), namely regional integration arrangements, is undergoing massive changes: apart from the formation of megaregional blocks and the sheer rise in numbers resulting in ‘disorganization’ (sometimes together with bilateral FTAs referred to as a ‘spaghetti bowl’ of alliances), the regional integration projects along the South–South axis are becoming the focal point of ‘alternative economic integration’ vis-à-vis the well-advanced integration system in the developed world. It is this intermediate layer of regionalism that may become a more prominent factor in the economic and political contradictions of the future world economy and the overall instability of the changing global governance system. There is, hence, a need to devise arrangements that may render greater stability in the global governance framework via coordination among regional institutions and integration arrangements. 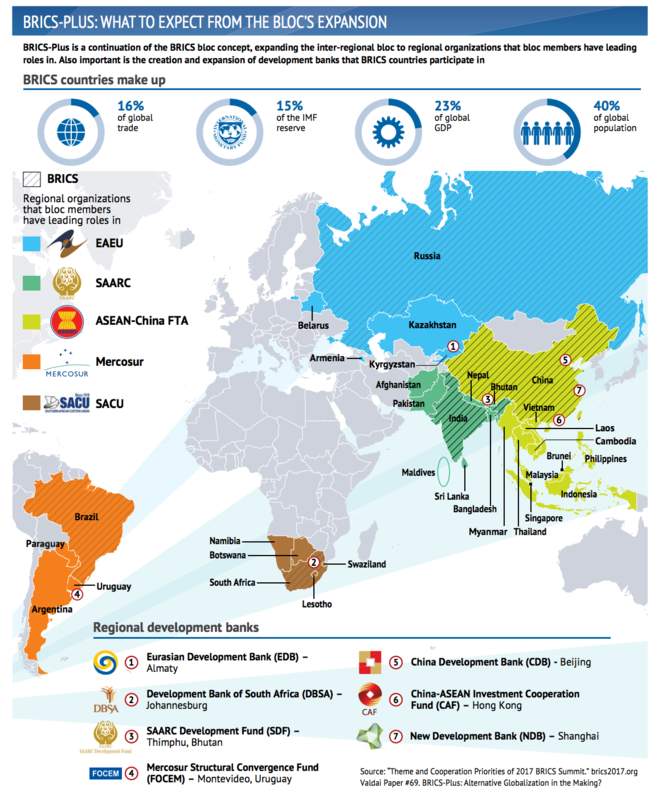 In this regard, in the sphere of cooperation among regional development institutions, there may be a case for multilateral consortia of regional development banks to promote connectivity as well as the broader development goals. A cooperative platform could bring together China’s development institutions as well as other development banks and funds from across the Eurasian continent. In the case of the Belt and Road Initiative, such a cooperative platform could bring together China’s development institutions as well as other development banks and funds from across the Eurasian continent – what may be referred to as the Silk Road Development Consortium – that would seek to exploit the synergies in the cooperation of the existing Eurasian institutions along the Silk Road route, ranging from the European Investment Bank in the West to China Development Bank and the China–ASEAN Investment Cooperation Fund in the East. The benefits could include possibilities for co-financing projects in the respective parts of Eurasia, the possibility to share expertise in infrastructure development, greater ability to develop longer-term strategies on common project pipelines, as well as the enhanced possibility to complement rather than contradict or duplicate each other’s efforts in the Eurasian space. Taking this a step further, the Eurasian connectivity projects like the BRI could be replicated in other continents – Africa or South America, where the lack of infrastructure development and regional connectivity is stifling growth. In Africa the continental consortium of development institutions could include the respective regional development banks such as the Development Bank of South Africa, the African Development Bank, etc. A similar continental platform could be created in South America to include the Inter-American Development Bank (IADB), Mercosur Structural Convergence Fund (Fondo para la Convergencia Estructural del MERCOSUR), Development Bank of Latin America (CAF) and other development institutions. Even more broadly, there may be a case for a global coordination mechanism among the largest regional integration arrangements from both the North and the South. Such a framework could operate separately on the basis of coordination among the respective regional development institutions, or it could be coordinated via global networks and organizations such as the G20 or the WTO. The G20 could be the best forum to launch discussions on such a platform and/or on broader issues of coordination among regional integration arrangements, given that it brings together the largest developing and developed economies that in turn are leading powers in their respective regions/continents, and that frequently head the formation of a regional economic block. The list of some of the largest regional integration arrangements in such a framework could include NAFTA and the EU, as well as MERCOSUR, EAEU and RCEP (once it is formed to include China and ASEAN countries). In summary, what is missing in the current system of global governance is greater coordination among regional arrangements – a system of ‘syndicated regionalism’ (Regionalism Inc.) that would fill the voids in regional economic cooperation. 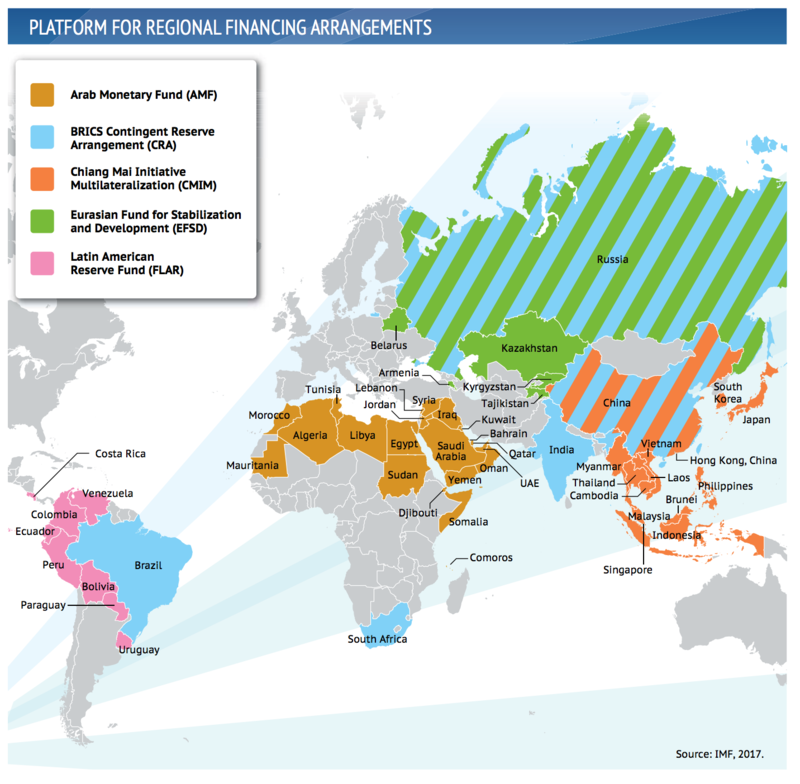 The process of coordination could be institutionalized via greater cooperation among the respective development banks and other institutions, with the roadmap for greater coordination in the regional sphere spanning the likes of the Shanghai Cooperation Organization (SCO) and BRI in Eurasia, as well as similar regional/continental syndicates in Africa and Latin America. It could further include a transcontinental element in global governance in the form of BRICS+ and a North–South cooperation mechanism that brings together the largest regional integration groupings. Rebuilding global governance architecture with regional blocks may serve to strengthen the ‘supporting structures’ of the edifice of the global economy – with hardly any attention paid to coordination among regional arrangements, as most of the coordination and regulation was focused on the nation-state level, or the level of global institutions. A globalization process that is based on integration and cooperation among regional blocks may harbour the advantage of being more sustainable and inclusive compared to the core–periphery paradigm of the preceding decades. Most importantly, ‘syndicated regionalism’ offers the possibility of additional lines of communication, economic cooperation and crisis resolution at a time when the fragilities in the global economy are transcending national borders and taking on regional dimensions (hence, IMF’s greater focus on evaluating regional economic vulnerabilities). A coordinated approach to regionalism allows the world economy to transcend some of the country-to-country barriers to economic cooperation, exploit regional ‘economies of scale’ in advancing economic cooperation, while at the same time potentially attenuating the risks of confrontation among the competing integration projects. The latter in recent years are increasingly directed toward the formation of megaregional blocks (the race to mega-regionalism) that in turn harbour ever-greater dividends as well as greater risks.